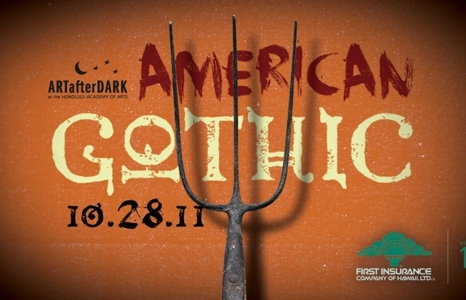 Join us for the ARTafterDARK 2011 finale! Come costumed as your favorite ghoul or goblin (or Grant Wood’s iconic painting) for this All Hollows Eve warm up with DJ Nocturna spinning, a Rock Band competition, and some spooky surprises. *Please be aware that costume accessories over the size of 15 inches and play weapons will be not allowed on site. This includes fake guns, swords, bow and arrows, staffs, large wings, or other large costume additions. Please plan on leaving these items in your car or in one of our lockers. Come early! Our sponsor, First insurance of Hawaii will be handing out special gifts to the first 500 costumed characters. *Admission is free for Academy members and $10 for non-members. DORISafterDARK: Don’t know what to do when the party’s over? Join us for our theater’s post-ARTafterDARK screening at 9pm. Don’t miss the gory comedy cult hit Dale and Tucker vs. Evil. See the website for details and to purchase tickets. Town brings a little treat to your tricking with their small plates in Luce Pavilion and Kinau Courtyards and specialty cocktails in Luce Pavilion, Kinau and Banyan Courtyards. DON’T STAND IN LINE—become a member for access to the members-only bar in the Mediterranean Courtyard—where you’ll find laser lights and a bubbling cauldron. 1) FREE: Street parking on Beretania and Kinau Street from 6 p.m.
2) $4: The Pro Park Parking Lot behind the Art Center at Linekona, entrances on Beretania and Young streets Payment is to be made at the yellow slot box next to the parking booth. 3) $5 at the First United Methodist Church Parking Lot on the corner of Beretania and Victoria streets. NOTE: lot closes promptly at 10 p.m.